Argentina, UK, Falklands and the Return of Old Patterns. Recently Argentina, with the 30th anniversary of the Falklands War (April 2012) approaching, has once again re-started the old debate about whom the Falklands (Malvinas in Argentina) should belong to. Once again the tensions between the two countries, Argentina and the UK have increased. 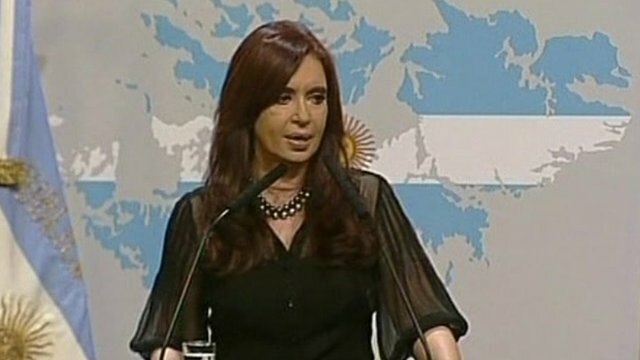 Argentina’s president Cristina Kirchner even accused the UK of militarizing the dispute by sending a naval ship into that region, and made a formal complaint to the UN. This is nothing but a repetition of old patterns. The Falklands War in 1982 was started by the then-ruling Argentinian military junta. Amongst many other reasons, the main reason was to divert attention from domestic problems. Back then the Argentina was under rule of a military dictatorship of General Galtieri, so there were clearly political problems. But moreover there were economic difficulties which were undermining the military junta’s control. What could be a better diversion than a war? Later on the defeat in the war meant the end of the dictatorship. Today the pattern appears the same. A need to divert public attention from domestic problems, means that Argentina’s President is again spurring up the old debate. She convinced many other Latin American countries to refuse ships from the Falklands in their ports. She called UK and British Prime Minister David Cameron “neo-colonialist”. It is very unlikely that since 2010 the problems disappeared or things improved, if anything they most likely got worse. Recently when I talked to one young Argentinian he did say to me that in his opinion with Cristina Kirchner and her policies Argentina is “becoming Venezuela”. To make a point, the Falklands never belonged to Argentina and the fact that they belonged to Spain before they became British does not change anything. And does anyone care what the inhabitants of the Falklands think? They do not want to be Argentinian, nor do they wish to discuss the sovereignty of the islands. Despite everything that Argentina says, its claims to those islands will never be legitimate. One should not forget that oil is involved. No doubt Argentina would like to get piece of the action. If Argentina really wanted to control the Falklands or at least have some influence there, it should do the opposite and start cooperating with the UK: open its sea ports, its airports and its economy to the Falklands. Argentina and Buenos Aires, especially, would make an ideal land base for processing and further transporting the oil from the Falklands. Free movement of people between the islands and the continent would definitely enable many Argentinians to move onto the islands and this could make those, “really more Argentinian”. There’s great economic potential in cooperation for all the parties involved and it could finally make Argentina and the UK put their history of hostility behind them. The economic potential that this cooperation offers would benefit Argentina’s economy and help resolve its economic problems and Cristina Kirchner would not have to divert the public’s attention away from it by making populist claims. Instead of trying to divert attention from a problem, it is better to try solving it.